Circular impact craters up to about 100 kilometers (60 miles) in diameter are seen in this view of Saturn's icy moon Dione. 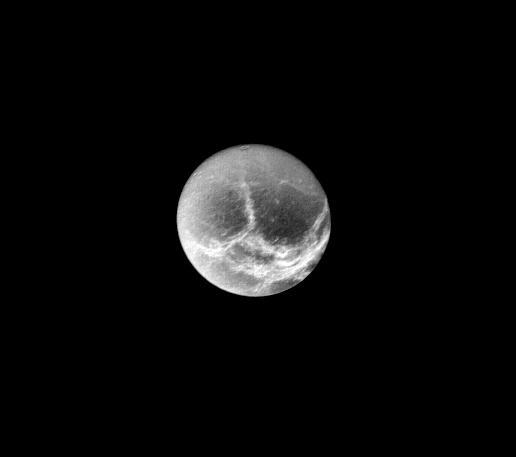 The image was taken by Voyager 1 from a range of 790,000 kilometers (500,000 miles) at 2:20 a.m. PST on November 12. Bright, wispy markings form complex arcuate patterns on the surface. These markings are slightly brighter than the brightest features seen by Voyager on Jupiter's moons, suggesting that they are surface frost deposits. The patterns of the bright bands hint at an origin due to internal geologic activity, but the resolution is not yet sufficient to prove or disprove this idea. Dione's diameter is only 1100 kilometers (700 miles), much smaller than any of Jupiter's icy moons. It thus belongs to a class of small, icy objects never observed before the Voyager I Saturn encounter. The view here is of the face which trails in orbit. The Voyager Project is managed by the Jet Propulsion Laboratory for NASA.